Alphen aan den Rijn is a town and municipality in the western Netherlands, in the province of South Holland, between Leiden and Utrecht. The town is situated on the banks of the river Oude Rijn (Old Rhine), where the river Gouwe branches off. It also contains the remnants of a Roman castellum. The municipality of Alphen aan den Rijn also includes the communities of Aarlanderveen and Zwammerdam. The town is located in what is called the 'Green Heart' of the Netherlands, which is a somewhat less densely populated center area of the Randstad. 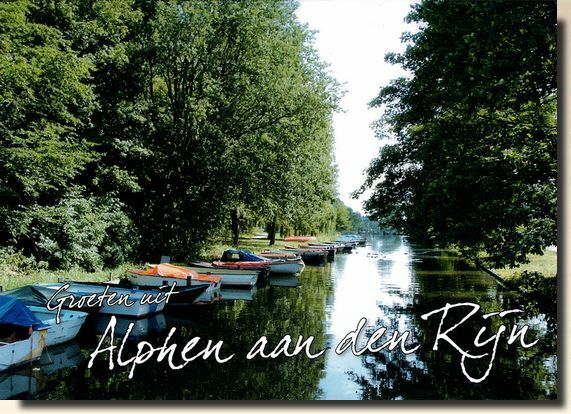 The name "Alphen" is probably derived from the name of the Roman castellum Albanianae, meaning "settlement at the white water" [wikipedia].